The new Firefox design Australis has not been out for a full release cycle in Firefox Stable yet, and Mozilla is already planning ahead to make additional changes to the browser. This time it is the browser's right-click context menu that appears when you, uhm, right-click on pages in the browser. 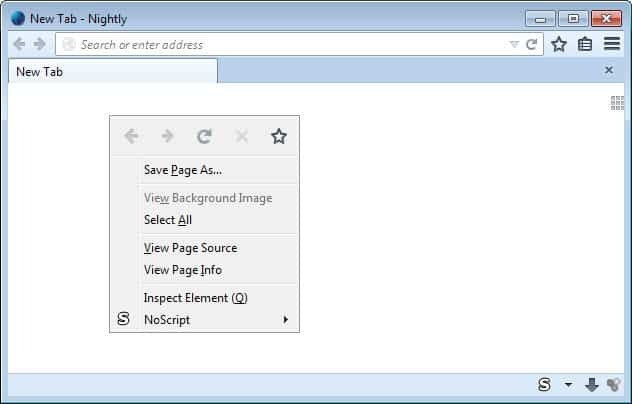 If you are currently right-clicking on a page in Firefox -- not a page element such as links, videos or images -- a context menu is displayed to you that you can use for various activities such as going back, reloading the page, or viewing the page source. Mozilla promises that the new context menu won't change the order of things or remove anything from the context menu. The organization has landed a first version of the new Firefox context menu in today's Nightly version update. The core change in comparison to the old context menu is the icon bar displayed at the top of the menu. The icons in that bar from left to right are: backward, forward, reload, stop and bookmark. It is interesting to note that this is the same sequence of menu items displayed in the old context menu with the difference that the new one displays icons and each item horizontally on the same line instead of underneath each other. What about keyboard navigation? This too works just like before. You can tap on down or up to navigate the menu and use enter to select one of the options. Note that left and right don't do anything here which may feel weird at the beginning as the cursor jumps horizontally in the icon row while you tap on the up and down keys. If you compare the context menu to that of Firefox on Android, you will notice similarities. While it is not identical, it features a similar icons at the top followed by other menu entries. Mozilla has no plans to switch all menu items over to icons. The main reason why is that many items do not have icons associated with them that are easy to understand. The current implementation lacks a couple of finishing touches that will be implemented in the near future. This includes lack of HiDPI and wrong size icons, that the bookmark star is not indicating if a site is bookmarked, and lack of inverted icons on OSX. Update: One thing that feels strange is that the reload button looks as if it is inactive when in fact it is not. This seems like a positive move. These were always icons and this is a great place for them. Not like when they did this in Microsoft Office. Can anyone tell the Paste Special icons apart in the Office context menu? I like that Mozilla is making some good decisions with Firefox now. I’m used to them only making bad decisions. Good. Translating vertical usage (five menu items) into a single horizontal space is all good. Saving vertical space is good in my book. How the hell do I revert this @$!^? If you have stylish you can use this. Is it possible to disable or at least reduce the size of these icons?